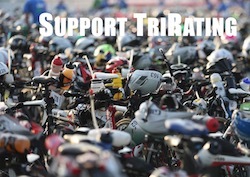 With Ironman Texas, the first big North American Ironman of 2013 is coming up. With 2.000 points for the winner, it is a great chance to get some Kona points, and the race always attracts a big and strong field. Update May 16th: Both Jessie Donavan and Haley Churra have switched their entries to IM Brazil a week later. Update May 17th: Caitlin Snow is also not starting in Texas. She was in an accident with an oncoming bike rider, but appears to heal up well to aim for IM CdA. The Course Rating for IM Texas is 09:55. IM Texas has 2000 KPR points for the winner. It has a total price purse of 75k$. My seeding starts with a lot of non-US athletes, but I’m sure that the Americans would like to repeat Jordan Rapp’s win from last year. However, none of the “first tier” of US athletes is on the start list – Justin Daerr (last year’s second, racing with the #1 bib) merely comes in as #11. My favorites are Jan Raphael (who had to cancel his Melbourne start) and James Cunnama (who had a frustrating DNF in South Africa). The home country can be a bit more optimistic on the girls side: A ton of US athletes will try to beat Rachel Joyce who is my favorite for the race. Really digging the NEW breakdown of swim, bike, and run times, thanks a bunch!! !